The most recent addition to my collection is this extremely hard to find boot. 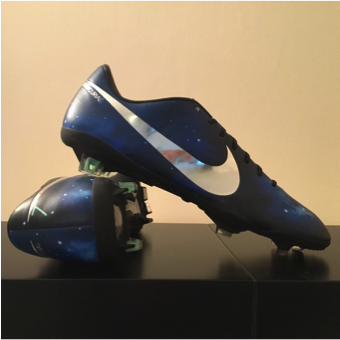 I purchased the general release version back in 2013 and they were my favourite boots, which had been designed for Cristiano Ronaldo. They were the 6th boot specifically designed for general release by Nike and the upper looks incredible on them. 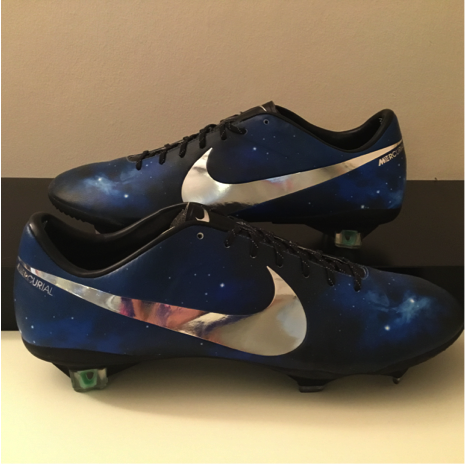 A campaign to go along with the boot was pushing the slogan of Ronaldo being out of this world. 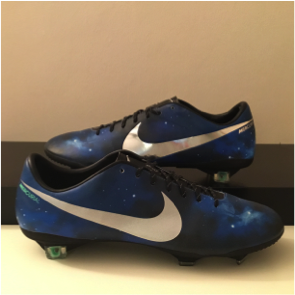 The new addition is a sample version of Nike Mercurial Vapor IX CR 'Galaxy'. All of the features on the boot are the same as the general release however, they main aesthetic difference is the Chrome Swoosh on the sides of the boot. This colour way on the dark blue upper looks incredible. I have attached a few different pictures so that you can see the clear differences and I think most of you will agree that the chrome looks amazing. Apart from the different coloured swoosh, subtle differences include the chrome written 'Mercurial' at the end of the swoosh as opposed to the green colour. 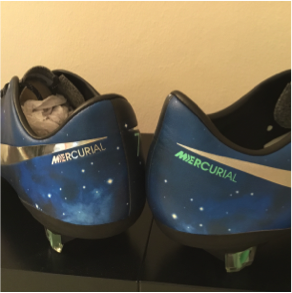 Also, on the opposite side of the boot there is simply a 7 compared to the general release which had a CR7 on the side of the boot. I wonder what made Nike change their mind on these subtle differences on the boots. 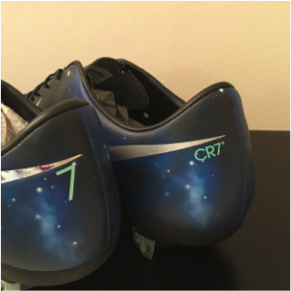 If you like this boot keep a close eye on the website for a look at all Ronaldo’s signature boots feature which will be coming up at the end of this month…….